Grant McCann had the belief that Doncaster Rovers could mount a serious promotion challenge from the moment he arrived at the Keepmoat Stadium. Evidently, that belief has rubbed off on his players. And on Tuesday night, as Rovers brushed aside Southend United in a very polished and professional manner, it felt like the night when everyone else really started believing. That was certainly the feeling in the press room after a business-like team performance, laced with flashes of individual brilliance from the likes of James Coppinger, Ben Whiteman and Herbie Kane. It feels like something special is happening. And, as McCann high-fived each and every player on the pitch at the final whistle, that seemed to be the mood in the stands too. There is, of course, still a lot of football to be played. But Rovers have momentum at just the right time and they have put themselves in a strong position heading towards the final straight. Not only are they scoring goals for fun but the new-look back four look like they have been playing together all season. The midfield unit was a joy to watch against the Shrimpers. There is confidence in abundance right through the team. 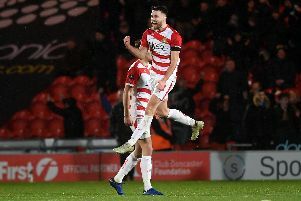 Rovers have everything to gain and absolutely nothing to lose against the Premier League outfit as they bid to reach the FA Cup quarter-finals - I repeat FA Cup quarter-finals - for the first time in the club’s history. It sounds incredible doesn’t it? It’ll take a very big performance to pull it off, but make no mistake - this Rovers team has the belief.